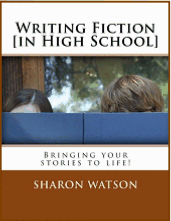 Writing Fiction (In High School) by Sharon Watson . . . TOS Review | My Journeys Through Life . . . Herding Cats In New Mexico! ← “V” is For . . . I have had the opportunity to review the Writing Fiction (In High School) curriculum from Writing With Sharon Watson over the past few weeks with “The Artist”. Because “The Artist” really likes to write stories, I thought Writing Fiction in High School would be a good fit for him, and when I told him I had the possibility of receiving it as a review product, he said he wanted me to go for it. Of course, this all changed once the curriculum arrived, and “The Artist” actually had to begin DOING the work involved . . . lol! He started back tracking and trying to get out of it, saying he only liked to write for enjoyment, not as an assignment. Once his dad and I reminded him though, that had he not told me he WANTED me to ask for this curriculum to review, I would not have done so, he settled down and got going with it. We have gotten almost through chapter 3 in the Writing Fiction (In High School). To complete this chapter, we needed to wait until we received the DVD “The Princess Bride” from amazon, as it is used in learning about motifs and patterns of three in writing fairy tales. The curriculum is laid out in fairly short lessons, with both the student and instructor being easily able to see where they end, because there are lttle boxes throughout the book with the words “End of today’s lesson” written in them. The Writing Fiction in High School is a two semester course for English credit, and there are no prerequisites needed. It is written to the student, and can be self-taught with guidance, or used within a co-op or private school. Beginning with chapter four, the student will be using a novel, “The Last Book in the Universe” by Rodman Philbrick, which you will need to purchase separately. It is to be completely read by the time the student reaches chapter four, as tasks will begin to be assigned based on the novel. It’s actually a pretty good book, written below the student’s expected reading level, because the idea is that he or she will not have to struggle with the reading in order to dissect the writing. An Inter-Dimensional Portal Opener was a hassle to build. But the love of science flowed through my veins like water over a waterfall, and nothing could dampen that love. Curiosity always kept me working through the night and through mealtimes. Daniel is my name and I was working on an invention that would change the world. Elisabeth, my sister, was always bugging me and never gave me any peace. suddenly look on in horror. Jolts of energy flew out from the machine and began to pull my whole lab into it. “Kangaroo feet.” I said as I’m pulled into the portal as well. Light shines into my eyes as I wake up and look around a while after I hit the ground. Much of my lab equipment was scattered around on the ground and some of it was broken into lots of little pieces. Orange trees were on my left. Peach trees were behind me. Quails were running around and pecking at the grass. Running over to the nearest orange tree; I plucked one of the fresh fruits from its branches and eat it. Sunlight was dimming and I needed to build shelter fast. Two hours later I had built a tree house and was sleeping soundly. Until…I heard a rustling in the trees nearby, I looked out the window to see what it was. Vultures wearing violet vests and playing the violin. Wonder why they were wearing vests and playing the violin? Zebras eating my mom’s front lawn! The textbook, “Writing Fiction [In High School] is available here for $25.05, and contains “practical lessons, approximately 100 interesting assignments, and hundreds of age appropriate fiction examples from classics to recent novels”. The student book is non-consumable, so it can be used again with subsequent children as they reach the grade level and ability for this curriculum. The teacher’s guide is quite useful, and if you’re going to use this curriculum I do recommend that you also purchase the guide, available for $9.95. Really, for the combined cost of $35.00, plus the cost of the paperback novel “The Last Book in the Universe, by Rodman Philbrick”, which I purchased for $6.99 (minus my educator discount) at Barnes and Noble, I believe you’re getting a very good deal on a two semester credit course for English, if you need to keep those kind of records in your home-school. I plan to continue using this with “The Artist”, and perhaps catch up to where he is, and do it along with him, as I enjoy writing, too. 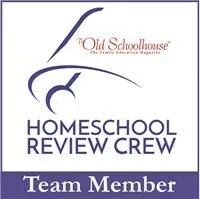 Other crew members reviewed either this or Writing Non Fiction in high school. To see what their opinions are, please click below. Tell him I *love* this story! It wraps up beautifully. I love your son’s story! It begins with tension and never lets up, plus it’s just so fun and interesting. What a great imagination! Thanks for sharing it in your review.